Around this time every year, the Islamic Movement of Nigeria or Shiites, partake in the Arbaeen Procession wherein they walk from all parts of Northern Nigeria to converge in Kaduna. During the procession in 2015, the group came in contact with the convoy of the COAS. They mounted road blocks and refused to move. According to the military the people hurled sticks and stones at the military convoy and the Army personnel in the convoy responded with gun fire. People died. After that, the military came back, to arrest their leader. The Shiites gathered as human shields, but that didn’t stop the Nigerian Army. That incident, referred to as the Zaria Massacre, led to the demise of 300 people and the incarceration of their leader Sheik El Zakzaky. The Shiite leader has been in detention since 2015, and his followers have been conducting frequent peaceful marches and protests in the capital city of Abuja, to demand the release of their leader. In 2016, the courts ruled that the leader be released, but the Nigerian government under the current administration have ignored court rulings and refused to release the leader. Around the 20th October 2018, the Shiite group called a press conference announced that they were going to start their annual procession. But the twist this time around, was they planned to converge in Abuja to protest the continued detention of El Zakzaky and demand his release. Everyone was aware this procession was going to take place, but proactive plans were not put in place by the government security agencies, to manage the situation. As a result, during the Shiite Procession in October 2018, history repeated itself. On the 27th October, the military says that troops who were transporting ammunition were prevented by members of the IMN from moving and subsequently attacked (pelted with stones) as the Shiites tried to take away the ammunition. The troops opened fire and 5 civilians were killed. The government has issues with the IMN and this is guiding a lot of their actions towards the group. The government claims IMN members disregard laws, rules and regulations of the land. It also believes that the IMN members and leaders are responsible for violations of the law, and since the IMN owe absolute loyalty to their Sheikh, then he must bear the responsibility for their lawlessness. This probably explains why the government under the current administration is still holding the leader in custody. While the IMN have been a relatively peaceful group, they have not been particularly law abiding during their marches. During the IMN procession and marches, motorists have complained about being grounded and having to wait for up to 5 hours until the procession moves past the highway and free up the roads. Also, most Nigerians know that there are certain protocols that must be observed at checkpoints or when a siren announcing VIP convoys approach your vehicle on the highway, you give way. But when it comes to the IMN on their procession, they defy the protocol and insist on having their way. The Shiites say that they often start their processions peacefully, but that they are sometimes attacked by local youths in the area. The police and other government security agencies are there to protect the constitutional rights of every Nigerian. Street protesters show up to express themselves and the Nigerian constitution guarantees the rights of any group of persons to hold peaceful marches or processions unhindered as long as it does not impede on the right of other citizens. 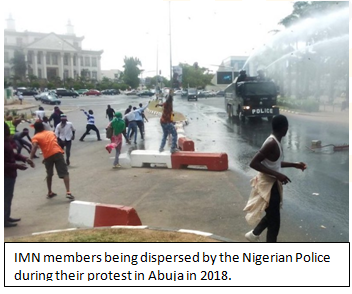 During analysis of the IMN protests from 2015 to date, there is usually a recurring theme. The Shiites start their marches, but are often met with police who immediately commence shooting teargas, water cannons and shooting bullets in the air to disperse them. If you have a group that constantly impedes on that right, you must have a robust plan to tackle the situation, and not through fatal gunshots, but through proactive planning and strategic dialogue. Former New York Police Department (NYPD) Police Commissioner, Ray Kelly, wrote in his book about the steps the NYPD took to handle crowd control and expected protests, when The World Economic Forum decided to hold their annual meeting in New York City in January 2002. The WEF conferences have always attracted significant protests, rowdy protesters, some he said, “with a proven penchant for violence”, as the previous summit had left one demonstrator dead. Past incidents had shown the need for an adequate plan to prevent chaos, as well as protect lives and property. A planning committee was set up and they started by focusing on gathering more information. They utilized open sources to get more details on the who, what, when, where, why, how of WEF related protests. The purpose of all this was to figure out the nature of threats to be expected, in order to put in place an adequate mitigation plan for it. Based on the information they got, they realized the best thing to do was to control where protesters were allowed to march, this meant closing up and barricading certain streets. The next step was to flood the streets with law enforcement presence. Official law enforcement vehicles and uniformed men from across the state were stationed along the areas where protesters will be located, letting those in attendance know the police were very present and willing to step in if needed. The next step was effective communication. It was important that the police communicated with the leaders of the protest groups to implore them on the need to keep the protests peaceful and keep their members/supporters in check. Today, items such as long range acoustic devices can be used to communicate with a crowd effectively. It was also important to communicate with the media to inform the public on expectations. Finally, those policemen who will be actively involved in crowd control on that day, had been trained on the necessary tactical techniques needed for quick response to violent demonstrations. They had also been kitted with the necessary non-fatal tools and equipment needed to effectively protect peaceful protesters or disperse violent crowds. Today, these would include the use of tear gas, bean bag rounds, rubber, plastic or wooden bullets, plastic cuffs, while been fitted with helmets, visors, body armor and so on. Careful planning on the part of both the military and law enforcement agencies would have prevented the crisis that ensued. The Government Security Agencies (GSA), could have put a proactive Crisis Management Plan in place, and communicated this across the various agencies, ranks, commands, units. For starters, a simple route assessment ahead of the military conducting their transportation mission that day would have advised against movement and/or recommended a different day, different route, or different mode of transportation to use. The streets could have been reinforced with additional law enforcement agencies including NSCDC, FRSC and all available uniformed personnel, who should have been given additional training on what their roles and responsibilities are as well as other urban area crowd control techniques. If the Nigerian Police Force was walking their talk in “community policing”, they would have taken some of their leaders, to establish a relationship and dialogue with the IMN leaders on the need for a peaceful march. In Nigeria today, the military is constantly being drafted to conduct civil policing duties. Research has shown that the involvement of the military in conflict drastically increases fatalities. Knowledge of this should guide the need for the government to reduce military involvement in local policing duties. However, until that happens, the military will have to ensure that its members who are involved in policing duties also get the training on how to conduct non-violent law enforcement and crisis management duties. Adequately training both military personnel as well as the police on proper crowd control techniques would have ensured fewer fatalities. Members of the IMN are not entirely devoid of participation in these violent clashes. The group has been accused by government officials and regular citizens alike for having complete disregard of state laws. Their procession has been banned in Kaduna, Kano and Kebbi, but they defy the bans and protest anyway, often clashing with local youths and pelting law enforcement. On the 9th June 2018, the Shiites held a protest where they burned Israeli and American flags in solidarity to Palestine. Such actions are not particularly peaceful gestures. Also, on 5th July 2018, there was a report released by the Middle East Institute which stated that Hezbollah was training Nigerian Shiites inside Lebanon. Infact, on the 21st June, there were reports that a policeman was stoned to death during a Shiite protest. These incidents and reports show how and why the Nigerian State is responding to the group in the way that it is. When allegations against the group are passed on to their leaders, the leaders tend to deny the allegations and instead blame “detractors”. The IMN leaders should do more to ensure their members refrain from insightful behavior, because the negative reports about the group are growing and like they say in Nigerian parlance: “there is no smoke without fire”. Most importantly, however, the Nigerian security community needs to learn from history and learn from their mistakes and successes alike. When the Shiite clashes occurred in 2015, a commission constituted to investigate what transpired and give recommendations to prevent future occurrences. The Commission concluded that the military responded with excessive use of force. At this point, the military could have made some updates to their Crowd Management Rules of Engagement (ROE) in Civil Cases. The new rules should have been effectively communicated along the chain of command and strictly enforced within their rank and file. This still needs to be done. History has shown that any harm to the leaders of sects in Nigeria typically exacerbate unrest. When Maitatsine leader Marwa was killed, his members fled to other states to continue their attacks and vandalism. When Boko Haram founder Mohammed Yusuf was killed, members fled to regroup, and later reemerged a deadlier force. The government must ensure that no harm comes to the IMN leader whilst he is still in custody, because IMN members keep proving that they are a resilient group who will never quit. But even peaceful groups can be pushed to the edge. 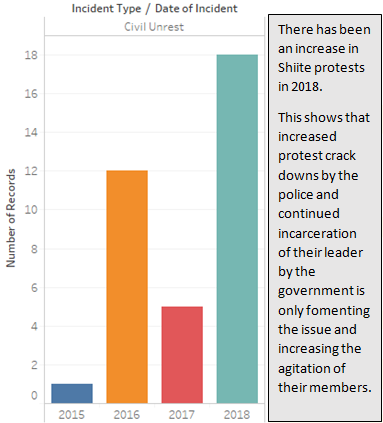 In 2018, there was a notable increase in the frequency and violent engagements of IMN protests. This year, we also witnessed the introduction of Molotov cocktails to the protests. The last thing Nigeria needs is another homegrown radicalized group with numerous members located across the country ready to die for their cause. The sooner the government engages IMN leaders and establishes a healthy agreement with them, the better off everyone will be.